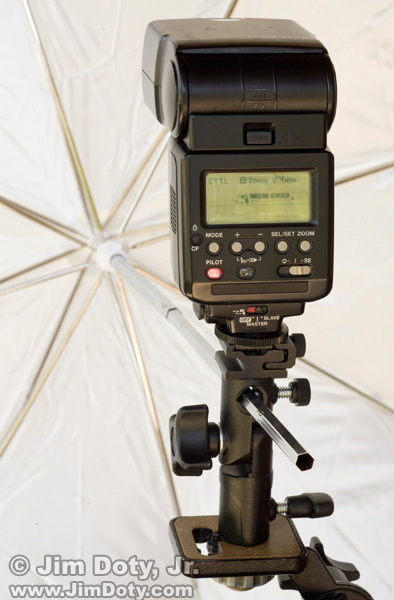 Flash, flash adapter, and umbrella mounted on a tripod. The light was provided by a Canon 550EX speedlite which was mounted on my tripod via a tripod to flash adapter. Unlike the illustration immediately above, I chose not to use an umbrella for the photo of Warren so the photo would have a little more “edge”. The flash was set to ETTL (automatic expsoure) and the switch at the bottom of the flash was set to “slave” mode (see the photo above) and triggered by a Canon ST-E2 infrared transmitter in the camera’s hot shoe. (If you use Nikon gear, the Nikon infrared remote is the SU-800 Commander). With this setup, the flash exposure is automatic. When enough light from the flash bounces off the subject and back to the sensor inside the camera, the camera sends a message via the transmitter to turn off the flash. You get automatic flash exposure in less than the blink of an eye! The camera can also set exposure compensation for the flash to allow for scenes that are brighter or darker than a medium tone. Although I have the Canon 580EX II speedlite, I prefer to use the 550EX flash unit when I need an off camera flash because it has a simple switch on the back to go from “master” to “slave” mode. (Canon should come up with more politically correct terminology.) 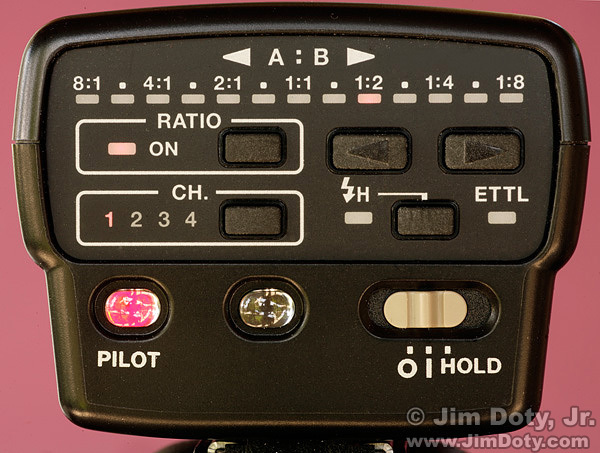 With the 580EX you have to fiddle with buttons and menus to get the flash into slave mode which takes way too long. I prefer one fast, easy to use switch that takes less than a second to use. The whole point of an “environmental portrait” is to show someone in their normal environment which is usually at work, at home, or involved in a favorite activity. Given a choice between shooting Warren at his desk or in the studio, the studio was my preferred location. Lots of people work at desks. 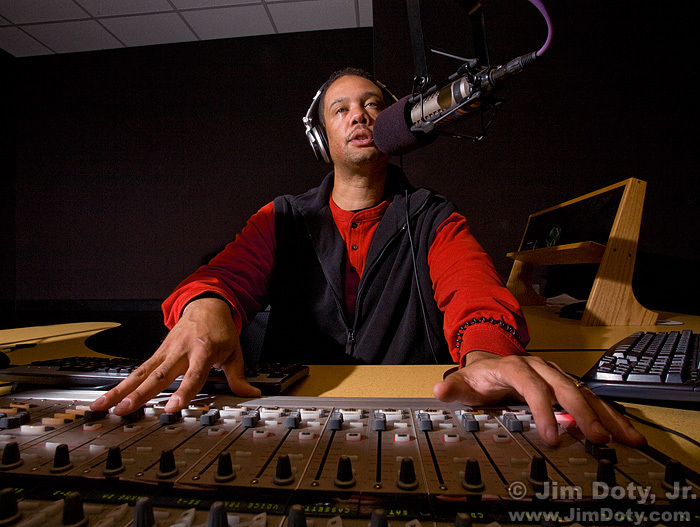 Not many people work in a radio studio. In this photo I wanted to show Warren using the board. I used a 17-40mm lens set to a super wide focal length of 17mm. I put the lens right at the top of the board, looking up at Warren’s and the microphone. I focused the lens on Warren but I used an aperture of f/16 to maximize the depth of field in the image. More information on flash photography, off-camera flash, flash exposure compensation, depth of field, and portrait photography are in Digital Photography Exposure for Dummies, one of the highest rated photography books at Amazon.com. If I were doing this same shoot today, I could just have easily used a radio controlled flash system. Original article written October 3, 2011. Updated and re-posted November 21, 2017. You can buy the Canon ST-E2 infrared remote and infrared capable Canon flash units (plus a lot more) in this section of at my photography store which has direct links to Amazon.com’s ordering system, excellent prices, and guarantee. Putting Together a “Studio in a Backpack”. Everything you need to take a small, portable portrait studio on the road. And you may have some of the items already. To learn more about flash, off-camera flash, studio lights and a whole lot more, read Digital Photography Exposure for Dummies, one of the highest rated photography books at Amazon.com. Learn more here and order it here. Read the article Excellent “How To Photograph People” Books for the best books on people and portrait photography. This entry was posted in Flash, General, Lighting, Photo Accessories, Using Equipment by Jim. Bookmark the permalink.